An AzerothCore Repack by StygianTheBest. StygianCore v2019.03.10 has been released! 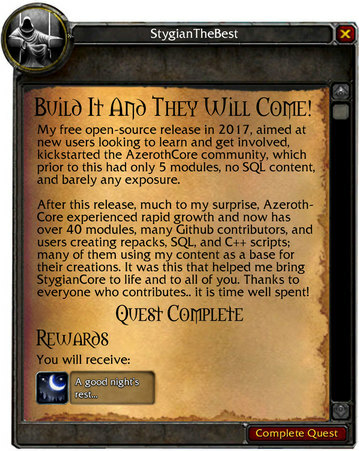 The StygianCore repack and sources have been completely upgraded to the latest revision of AzerothCore. I did not want to delay the initial v2019.03.01 release of the StygianCore repack, so it did not include the recently revised database structures or important commits that greatly improve the core. If you are running a previous version, I highly recommend moving to this one ASAP. The StygianCore repack will now be released quarterly and will incorporate the latest AzerothCore changes as well as any updated or additional StygianCore custom content. The project sources will be continually updated as I make changes and pull from the AzerothCore repository. Welcome to StygianCore. This repack is powered by AzerothCore and would not be possible without the players, developers, and communities of the World of Warcraft MMO emulator and private server scene. A big thanks to everyone for any and all contributions absorbed to make this repack possible. Your hard work is much appreciated! This project is, and will always be, FREE! I designed it with lots of comments and templates to make life easier for new developers and creators to get started. My hope is that all of the hard work I put into this will inspire others to get involved and create more cool and interesting projects for the WoW Emulation community. This repack is dedicated to the late Michel Martin Koiter (May 4, 1984 – March 18, 2004). His shrine in World of Warcraft served as a place of solace for myself, my guildmates, and countless others in the classic days of World of Warcraft and beyond. Michel Koiter was one of Blizzard Entertainment’s premium artists and a member of Sons of the Storm. He went by the moniker “Twincruiser”, an artistic collaboration with his twin brother René Koiter. Just a few months before World of Warcraft’s release, he died of unexpected heart failure. He was 19 years old. The cause of his death was never really understood and remains shrouded in mystery. 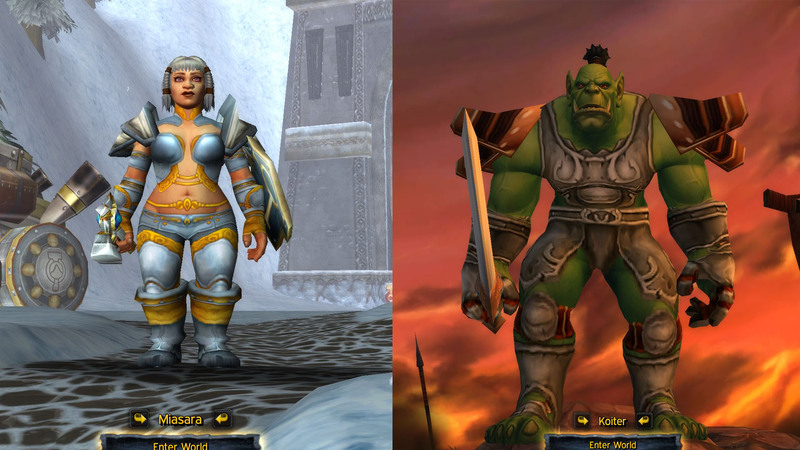 I recreated Michel Koiter’s orc warrior, located at the Shrine of the Fallen Warrior in The Barrens, as closely as possible. It is said that the gear his orc has equipped is exactly as it was when he last logged out of the World of Warcraft Beta. A custom NPC is available in normal and ghost form. The Guildmaster character for the Horde is Koiter’s orc warrior complete with armor and sword. This specific armor he wore was unused, marked for use by NPCs, and not accessible to players. I located each item in the data files (quite the chore!) and updated the entries in the Item.dbc and ItemDisplayInfo.dbc to make them useable as item id 701005 thru 7010012. The correct shoulders were found, but not the one-shoulder variant that Koiter’s orc is wearing on the shrine. After looking at the shrine again, my theory is they removed the left shoulder of the model because it would have stuck into the shrine wall. It is said that his ghost still wanders the Barrens looking for a good brawl. Rest In Peace.. See you on the other side brother. StygianCore is World of Warcraft v3.3.5a server powered by a modified build of the AzerothCore World of Warcraft v3.3.5a server emulator. Last fall I promised to release a repack of this server for friends to host at home. Additionally, I wanted to share a fun levelling server for solo or 4-10 player groups and help others who want to exprience the nostalgia of the past and get started with development, scripting, and building their own server experience. Included are custom tools and docs for maintaining the game database and automating archive, save, and restore operations for sandboxing, testing, and development. In addition to new content, this repack includes updated versions of my C++ modules, SQL templates, custom tools, and client modifications from my AzerothCore Content release in summer 2017 which included 11 new modules and a lot of ported C++ and SQL from TrinityCore. You should read the rest of this document thoroughly before submitting any questions or bug reports. From here you can continue reading - probably a good idea - or skip to the Getting Started section. This repack is released with no official support. All questions, requests, and bug reports should be directed through the StygianCore GitHub repo(s). Be sure to follow the repos to see when I put out an update or bugfix. I will respond to all questions as time permits. Documentation for the this repack and its contents can be found throughout the documents, code, SQL, and scripts. For more information you can visit my website or peruse the GIT repos. I’ve tried to be as detailed as possible to diminish the learning curve and get new users up and running quickly. The Support folder also contains documentation and other support files. You can view many these files by by starting the included Apache Web server and visiting the Account Registration Portal at http://127.0.0.1/. Easily backup, restore, and archive the accounts, characters, and game world. A repack update function is included to support future revisions. XP gain for exploration has been doubled. Mail Delivery Delay reduced to 10 seconds. Tome of World Flying allows flying in classic zones. Random chance to enchant gear on drop, quest, or craft. Grant special abilities of other classes such as Sprint, Remove Curse, etc. Player XP rate configurable as you play. From the console type: .xp set <rate 0-10>. Includes two default characters and guilds for Horde and Alliance. Guildmaster characters are owned by the Administrator account. Guildmaster characters are equipped and ready for play. Dungeon Checkpoints: You resurrect at the last or closest boss killed with 25% health/mana. Dungeons and Raid difficulty is auto-scaled based on player count and other factors. Quest, Raid, and Party requirements for entering instances are ignored. Quest’s can be completed while in raid groups. Creature aggro rate reduced by 25%. Creature assistance radius reduced by 25%. Creature flee assistance radius reduced by 25%. Durability hit on ressurrection reduced to 5% from 25%. Battleground Deserter debuff is disabled. PVP kills can allow the player to loot a configurable percentage of the victim’s loot if desired. A bounty system can award players a configurable amount of money for mob or player kills based on level if desired. World, Dungeon, and PVP kills are announced to the world. All classes can adopt beasts like the Hunter class that will assist you in battle. Players can now learn up to 11 professions. Weapon skills level up to max with each level gained. Skill gain on crafting has been doubled. Skill gain on gathering has been doubled. Skill gain on greens increased to 50%. Skill gain on greys increased to 25%. A client patch is required to enable this content in the repack. BeastMaster NPC: Allows all classes to have and control hunter pets. Bengal Tiger NPC: If you can find the cave, she gives you the Bengal Tiger! Buffer NPC: Buffs players with one click. Codebox NPC: Allows codes to be entered for gold and items. Enchanter NPC: Offers all weapon and armor enchantments. Fisherman NPC: A custom fishing vendor with a path, waypoints, and speech. Gambler NPC: Allows players to gamble their money. Gift Box NPC: Sends players gifts at specified times like level-up. Global Trainer NPC: Trains all classes and skills. Jukebox NPC: Plays much of the music content and videos in the game. Koiter NPC: A recreation of Koiter’s character from beta in normal and ghost form. Loremaster NPC: Recants lore and trivia of WoW at specific locations. Multi-Vendor NPC: Allows multiple item iventories on one vendor. Portal Master NPC: Provides quick transport all over the realm. Trollop NPC: Everyone needs someone. Transmogrifier NPC (Eluna): Transmog your gear. World Trainer NPC: Trains every class, skills, and flying. StygianCore Specialty Vendors: Over 30 new vendors with custom item sets are placed in various locations throughout the land. Heirloom Vendors in all player starting zones. NPC Model Mall: Generates hundreds or thousands of NPCs with unique models. NPC Model Randomizer: Randomizes the models of NPCs from a list of valid models. Vendor an items have been repriced using the included item pricing template. The included repricing template can be adjusted/imported to suit your needs. A client patch is required to see the icons for the custom items in this repack. Personal Teleporter: An item that spawns a teleport NPC that fades after use. Level-Up Token: An item that levels the player up on use. This is a unique item. Tome of World Flying: Sold by all flight masters. Allows flying in classic zones. Azerothian Humor Vol.1: A book of WoW jokes. Not sold in stores! Parents beware! GameMaster’s License: A vanity item for kids so they can brag about being a REAL GM! This repack includes the Eluna LUA Scripting Engine. The Eluna Lua Engine© API allows you to add your own Lua code to be executed when certain events (called “hooks”) occur. Add a new in-game command, give life to creatures with new AI, or even light players who try to duel on fire! If the hook exists, you can script it. You can find the included and sample scripts in the Server\Core\luascripts folder. Eluna allows functionality such as Rochet2’s Item/Player Gossip for TrinityCore. Be sure to look at the config files for the world server and modules located in the Server/Core folder. You can modify these files to configure how the server and modules work and what features are available for each during gameplay. This repack includes a default Administrator account. It is used to log into the server console, the WoW game client, and for SOAP communications via the Account Registration portal. This server and tools are portable. You can run it from any folder. A server launcher, front-end, and process monitor. Start/Stop/Restart World, Character, Auth, Web servers. Dedicated launch icons for StygianCoreTools and HeidiSQL. Monitors server processes (World, Auth, MySQL, Apache). Gracefully shuts down the database to prevent data loss. Monitors and logs crashes and other system events. Docks to systray with process uptime as balloon text. Green: Process is running and uptime timer is ticking. Red: Process is not running. Yellow: Process path not found. Click to set a new path. Book: Expand the window to reveal the log and other options. Sword: Launch StygianCore Repack Maintenance Tool. Gold Coins: Launch the included HeidiSQL Portable application. Shield: Not Shown Hides running processes windows. Easy backup, restore, archive, and testing of game data. All backup and archive data is stored in the Tools/Temp folder. Dynamically rebuilds restoration archives for quick updates. Allows selective backup and restore for just auth/character or world databases. Auto archives any existing backups when a backup is run. Restores the server db and configuration to the current state of the restoration archive. This is a great feature for sandbox testing. Has error-checking to make sure everything works as intended. Only visible if a repack update archive is found. Updates the repack to the latest release. This will save the current game world. Worlds can be reloaded without affecting the account/character data. If an existing backup is found, it is archived. Exports the servers current accounts, characters, guilds, etc. Accounts/Characters can be reloaded without affecting the world. Only visible if a world backup is found. Imports the saved World from Option 1. Accounts/Characters are not affected by World imports. Only visible if a account/character backup is found. Imports the saved Account/Character data from Option 2. This will restore the repack to its default state. This is a destructive restore. You will lose all current data. This will rebuild the restore_stygiancore.zip restoration archive before deploying. Uses the newly minted restoration archive to perform the restore. Saved World and Account/Character backups can be reloaded on top of a fresh restore. Use this after updating game files in the restoration archive to commit the changes for future rebuilds. Starts/Restarts the Auth and Worldserver processes. Creates the ModelMall that allows you to preview thousands of NPC models at once. Randomizes the NPC models on GM Island. You can ignore this option if you’re not compiling. Launches the UpdateDeploy.bat to handle deployment of build files. Automates copying of Debug, RelWithDBInfo, and Release builds + confs for testing. Has an ‘Auto-Run’ toggle for starting the server after deploy. Use this to temporarily alter the ports and server credentials. I’ve packaged a few custom tools I use for administration of the server. Batch files are used extensively to automate many file handling and database import/export functions. These are used for customizing the launch of server processes and tools and providing ways to automate tasks from the SCC launcher or SCT. There’s one for each major server process and a few tools. The header of each file contains its original filename and a description of what function it performs in the repack. Included only for reference, but makes deploying and testing new builds of each type a lot easier. Edit the paths to match your system. Automates testing of different Visual Studio builds on my test server. Supports Debug, RelWithDebInfo, and Release configurations. Supports “Auto Start” after deploying. Great for testing build changes quickly. An excellent free database management alternative to NaviCat. Launched via a dedicated launch button in the SCC launcher or via batch in the repack root folder. Set your realmlist.wtf file to point to the server. For local play it should work with the default of 127.0.0.1. NOTE: If you are using the StygianCore Client Pack, a batch tool called SCUpdateIP.bat is included that automates this procedure and gives you flexibility for using one client with serveral different servers. If you are putting the server on a different system, you will need to use that system’s address. In addition, you will need to edit the auth database realmlist table to point to that system. In the example, the server is listening for remote connections on 192.168.1.20 with a local address of 127.0.0.1. Here’s a sample query to change the IP. Copy the client patch files from the repack’s ClientPatch folder to your client’s Data folder. These files are required to support custom items, objects, and other content in the repack. NOTE: Be sure to delete your client’s cache folder after copying the new patches! This is the client support patch required to display and enable custom content in the repack. Required to support custom items and content in the StygianCore repack. Required to enable access to forbidden zones. Required to enable custom textures on some custom NPCs. Custom items will appear as a ? icon in your character’s backpack. Custom NPCs will not display custom weapons and armor. Custom NPCs will not display the correct textures. The game client will crash when attempting to access forbidden zones. To complete the StygianCore experience, I suggest downloading my World of Warcraft 3.3.5a Client Upgrade which includes HD Player and Creature Models, Random Animated Login Screens, Custom Add-Ons and more. This repo is the home of all future updates to any of the content in this repack. The folder structure is a mirror of the file structure within the repack archive, so you can easily download and copy file updates into your repack or restoration archive. - SQL templates for creating items, npcs, etc. - The master restoration archive. - All game SQL, conf, and other updates are stored here. - This is where the magic happens.. The Codex of Ultmate Wisdom! You will need a few things to compile the source of this repack. The source can be found in the GitHub Repo. Below are the specific tools and versions I used to compile the repack on my virtual machine. You may be able to use updated versions. The MySQL server included in this repack also contains the TrinityCore databases from 2019-01-27. These are used for a TrinityCore Sandbox repack I’ve created for adding custom content with Rochet’s GOMove and DressNPC tools. 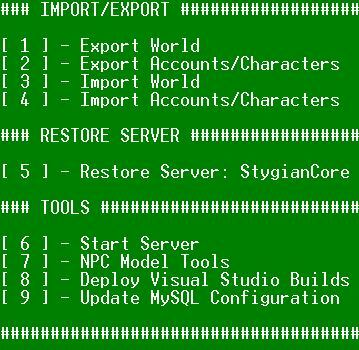 It shares the database server with StygianCore to make imports from core to core a breeze. You can find more info on that project at my website. This is the timing for Restore (Option #5) in StygianCoreTools.bat. World of Warcraft© and Blizzard Entertainment© are all trademarks or registered trademarks of Blizzard Entertainment© in the United States and/or other countries. These terms and all related materials, logos, and images are copyright Blizzard Entertainment©. This site and content is in no way associated with or endorsed by Blizzard Entertainment©.